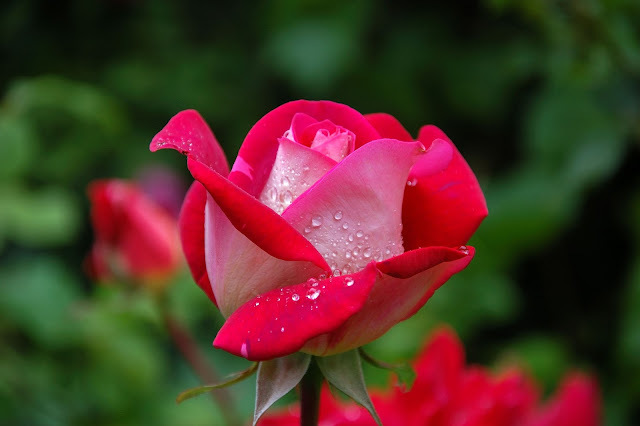 The rose is a type of flowering shrub that belong to the family of plants called Rosaceae. Roses are native primarily to the temperate regions of the Northern Hemisphere. All roses were originally wild and they come from several parts of the world, North America, Europe, northwest Africa and many parts of Asia and Oceania. There are 100 different species of roses. The flowers of most species of rose have five petals except for the species ‘Rosa sericea‘ which has only four. Large number of petals is a result of mutation and it can be seen in cultivated roses. The cultivation of roses most likely began in Asia around 5000 years ago. Most roses are deciduous but a few (particularly from South east Asia) are evergreen or nearly so. Rose is the most popular flower in the world followed by other flowers such as Chrysanthemums, Tulips, Lilies, Poinsettias, Narcissus etc. burgundy, violet, orange and red colors. Blue and black roses do not exist. A “black rose” is not actually black it is very dark red. And to make blue roses, it is necessary to borrow the delphindin gene from another kind of flower and splice it into the genes of the rose. Each color of the rose symbolizes certain value. Red rose is a symbol of love, yellow of friendship, orange of enthusiasm, white of purity, pink of joy, burgundy of beauty and violet of royalty. Size of rose depends on the species. Flower can reach from 1.25 to 84 cm (0.5 to 33 inches) in diameter. Certain species can reach 7 meters (23 feet) in length. prickles.They look like hooks which facilitate bonding to the other plants (in the climber types of roses) and protects stem from herbivores. Roses can survive for extremely long periods of time.The Thousand-year Rose grows on a wall of the Hildesheim Cathedral, a Catholic cathedral in Hildesheim, Germany, that is dedicated to the Assumption of Mary. It is believed to be the oldest living rose in the world. The famous Cleopatra of Egypt was believed to have covered the floor of her palace room with roses before Mark Antony visited her. During the fifteenth century, the factions fighting to control England used the rose as a symbol. The white rose represented York, and the red rose symbolised Lancaster. Not surprisingly, the conflict between these factions became known as the “War of the Roses“. It wasn’t until the late 18th century that cultivated roses were introduced into Europe from China. In Greek Mythology, Aphrodite, the Goddess of Love, is said to have created the rose from the tears she cried over the blood of her beloved, Adonis. The Romans turned Aphrodite into their goddess Venus, who also adopted the rose as significant. Rose oil is an important ingredient in the perfume industry. Extraction of minimal amount of this oil requires huge amount of roses (one gram of oil is produced from two thousand roses). The nice scent of the rose comes from microscopic perfume glands on the petals. The Rose Valley in Bulgaria is famous for its rose-growing industry which have been cultivated there for centuries, and which produces 85% of the world’s rose oil. The world’s largest rosebush is of the Lady Banksia variety. The rosebush’s canopy measures 790 square meters (8,500 square feet), its trunk has a circumference of around 3.6 meters (12 feet).It was planted in Tombstone, Arizona, in 1885. The Rainbow Rose is a genuine rose with highly attractive colors. Each rose petal has one of the colors of the rainbow. And so, with her seven different colors, this rose sets the imagination on fire. Juliet rose is known as the “£3 million rose” ($4.37 million) because that’s how much it cost famed rose breeder David Austin to create the apricot-hued hybrid over the course of 15 years. It debuted in 2006 at the Chelsea Flower Show, and took the floral world by storm not only for its blushing beauty, but because it was the most expensive rose ever developed. Many species, particularly the rugosa rose (R. rugosa), produce edible rose hips, which are a rich source of vitamin C and are sometimes made into jam, jelly, or brewed for tea. The leading country in exporting roses is Holland or the Netherlands. They use 8000 hectares (19,768 acres) of land to cultivate roses. One of the oldest fossils of roses discovered in Colorado dates back from 35 million years ago. There are over 4000 songs dedicated to roses.